be pleased and cannot rule out a military response. 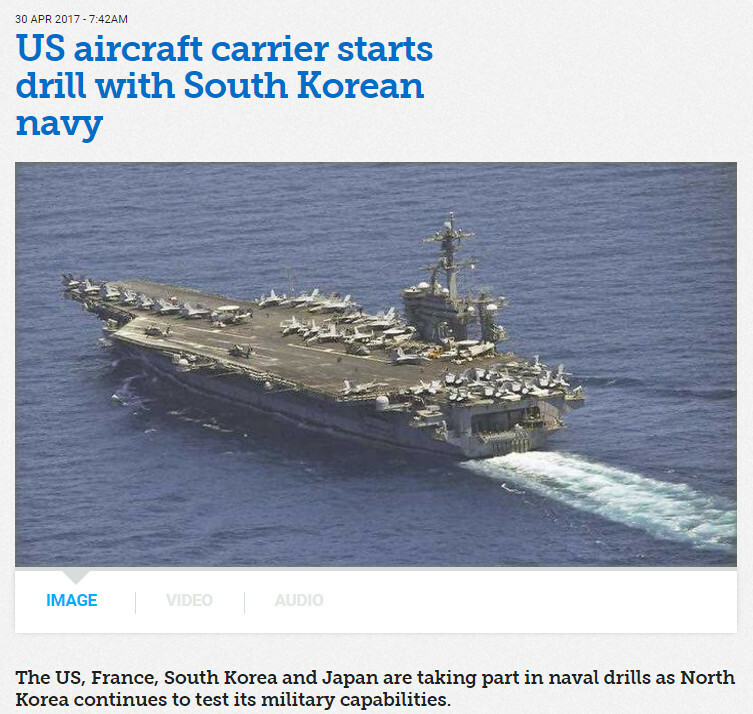 North Korea claims the buildup of US troops in Darwin, Australia, is proof America is getting ready for nuclear war. Its main newspaper is accusing the US of trying to optimise its nuclear readiness in the region, noting it's the largest US military presence in Australia since World War II. The leader of the Darwin based air-strike force says it's in a strategic location and the US 'stands ready to fight'. The US deployment to Darwin has been conducted since 2012 and at around 1250 Marines and naval personnel is half the 2500 originally proposed under an agreement between the US and Australia. Former US Ambassador to Australia John Berry said the situation in North Korea would likely head discussions between President Donald Trump and Prime Minister Malcolm Turnbull next week. 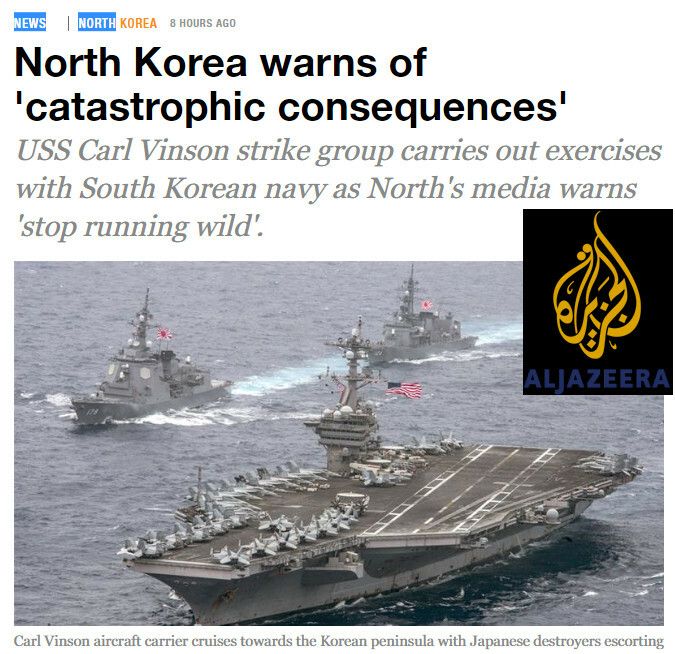 The US aircraft carrier USS Carl Vinson on Saturday, April 29, kicked off a joint drill with the South Korean navy, officials said, as tensions rose over North Korea's latest test-fire of a ballistic missile. "Immediately after the aircraft carrier arrived in the Sea of Japan, South Korea and the US strike forces launched a drill from 6:00 pm (0900 GMT) Saturday", a defence ministry spokesman told AFP. that is providing further background information. carrier and submarines will be turned into scrap iron. is getting the most critical one in 50 years. Trump: If the conditions are suitable, I will meet with Kim Jong-Un. 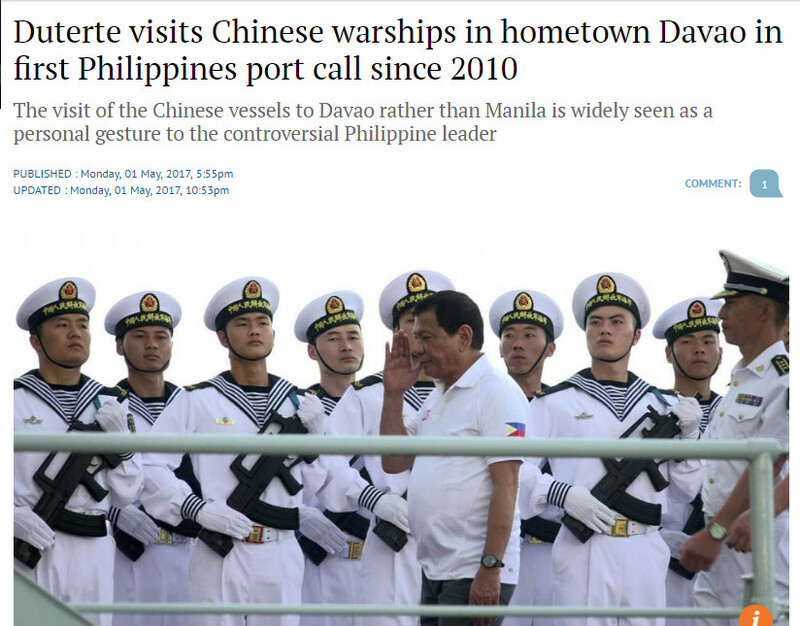 On Sunday, April 30, three Chinese Navy vessels arrived on a three-days surprise visit in Davao / Mindanao, hometown of the Philippines' President Duterte who then boarded China's missile destroyer Chang Chun. 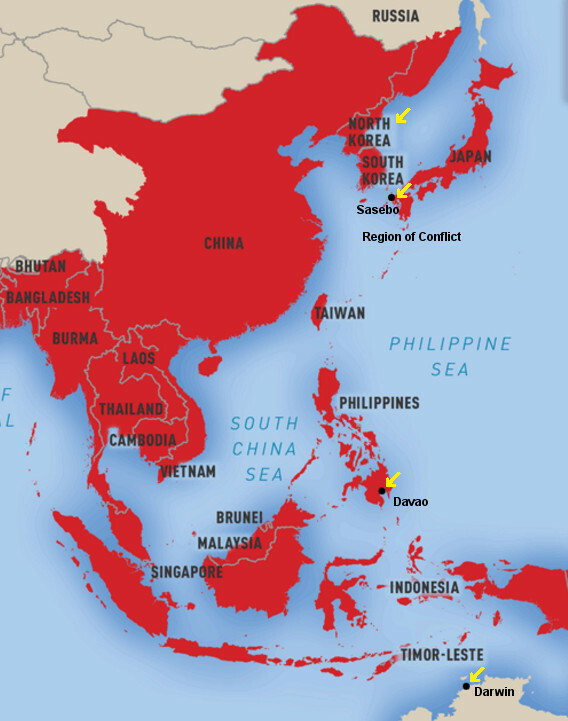 Earlier tensions about territorial disputes in the South China Sea are seemingly forgotten, while Duterte recently concentrated on North Korea which he said was willing to "end the world". Sasebo naval base is among the most important military seaports for Japan's maritime self-defence. Inside that naval base are stationed the 5th, 6th, 8th and 13th guard units. It hosts 15 main force warships of different types. 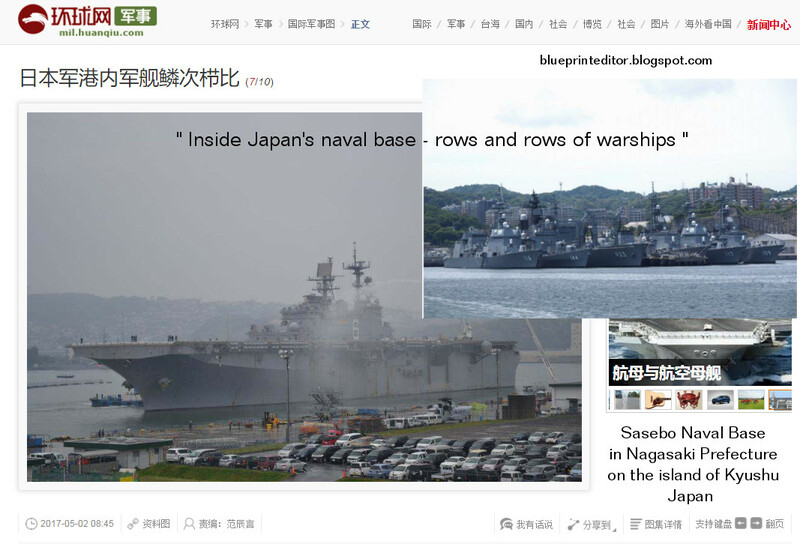 "U.S. Fleet Activities Sasebo" is a United States Navy base in Sasebo, Japan, on the island of Kyūshū. It makes part of the Japanese Sasebo naval base in Nagasaki Prefecture. The U.S. base provides facilities for the logistic support of forward-deployed units and visiting operating forces of the United States Pacific Fleet and designated tenant activities. 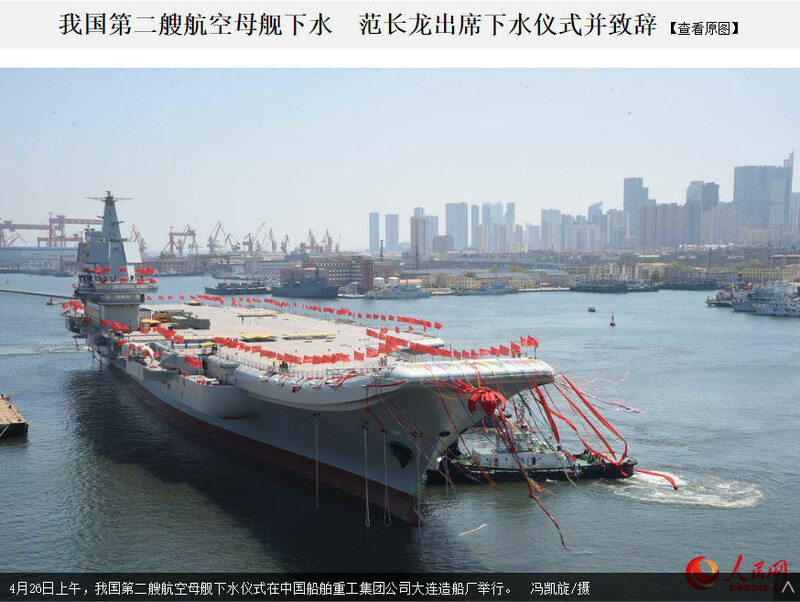 Yesterday, April 26, at 9 am local time and on the 68th birthday of China's navy PLAN, China's 2nd aircraft carrier of the Liaoning-class has been floated off its dry dock at Dalian. The ceremony was attended by members of the Central Committee of China's Communist Party and many high-ranking military leaders. While the first carrier "Liaoning" was based on the semi-finished Soviet-era vessel "Varyag" which belonged to the Kuznetsov-class, China's second carrier has been completely home-built. Its name is still unknown, but rumours are saying it might probably be named "Shandong" on a later occasion. 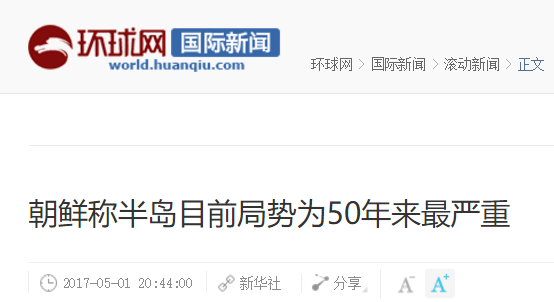 A Chinese language news portal quoted by western sources had previously reported that the ship will have an aircraft capacity of 28-36 aircraft split between Chinese Shenyang J-15 fighters and helicopters, which is the same as that of the Liaoning. 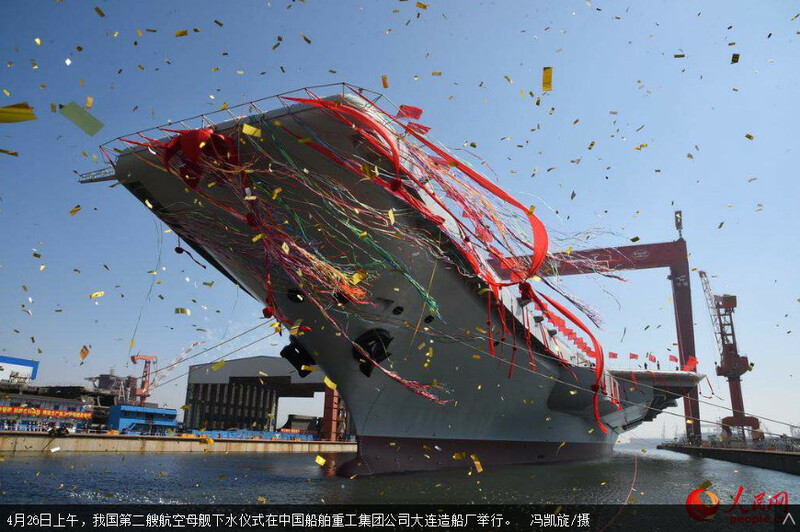 According to the new vessel's outward apperance, the most significant change from the "Liaoning" seems to be a reconfiguration of the phased array radar panels, with those on the new ship facing diagonally outward on both sides of bridge fore and aft. The new 50.000 tons aircraft carrier like the fully-operational "Liaoning" might still be able to use heavy SS-N-19 anti-ship guided missiles but which has never been confirmed. 12 SS-N-19 missiles of Soviet-era origin once belonged to the armament of a Kuznetsov-class aircraft carrier and might present a serious danger to western ship units if still available, especially when used with a nuclear warhead. will China know how to interfere ? 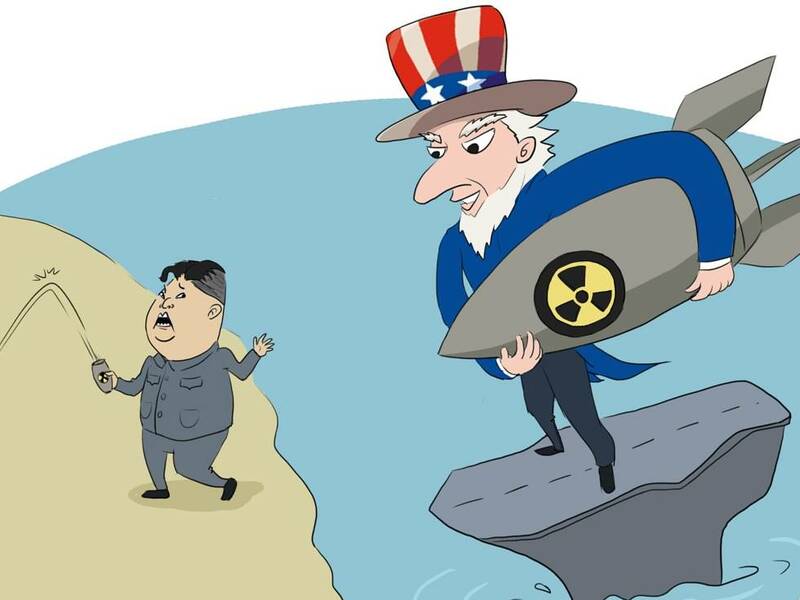 A few days ago, China's official paper "Global Times" said in its editorial: " If North Korea continues its activity of developing serious nuclear missiles, the U.S. will carry out an attack against its related facilities in some kind of a surgical operation. Beijing would then react with diplomatic resistance, however not feel obliged to interfere. " 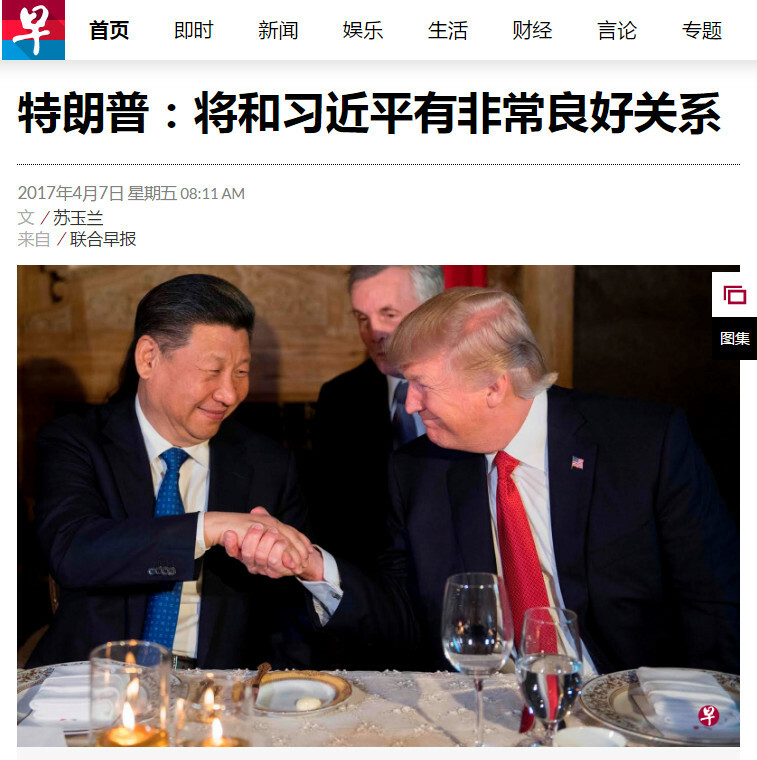 Trump: Enjoying unusual fine relations with Xi JinPing. 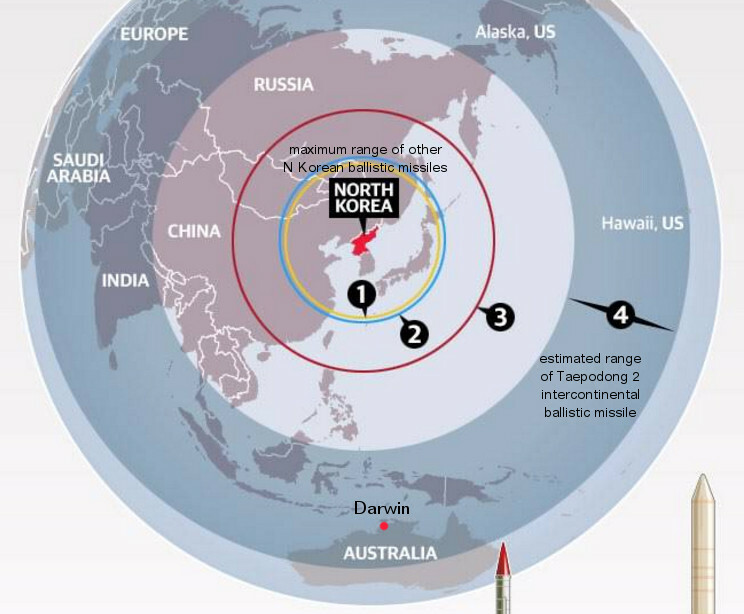 N Korea - Culmination of Tensions Preparing US Strike ? North Korea threatens ‘merciless military strikes’ against US, as U.S. vice president Mike Pence visits the demilitarized zone between North and South Korea. The isolated nation has trotted out three of its most senior officials to amp up its war rhetoric against the US. North Korea’s deputy foreign minister, Sin Hong-chol, has told Al Jazeera that its army is on “maximum alert” after US Vice President Mike Pence visited the demilitarised zone between the two Koreas on Monday. “The time of dictating orders by brandishing the US military might has gone,” Mr Sin told the Arabic broadcaster. The official made a passing swipe at Mr Trump and his administration, referring to him not as the President but as a “businessman”. “If those businessmen in power in the US thought of intimidating us by any military or sanction threats — as the [Barack] Obama administration used to do and failed — they will soon find out such threats are useless,” Mr Sin said. 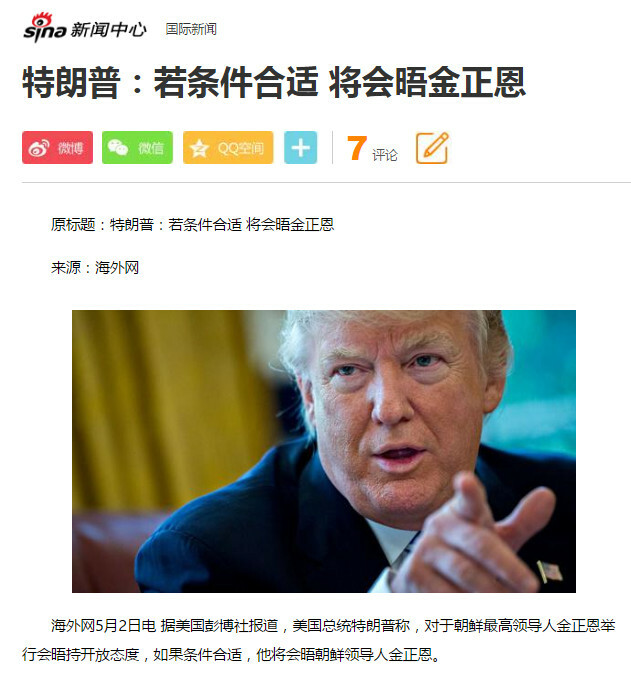 "Mr Trump has tried to use trade incentives to pressure China into doing more to stop North Korea’s development of nuclear weapons", but Mr Sin implied this tactic would not work. “The nuclear weapon in our possession is not illusion; it is not a commodity that may be traded for American dollars, nor is it for sale. So it cannot be put on the negotiating table with the aim to rip it off,” he said. The country’s deputy ambassador to the United Nations, Kim In Ryong, has called the US a “gangster” hellbent on “disturbing peace and stability”. He accused the Trump administration of turning the Korean peninsula into “the world’s biggest hotspot” and creating “a dangerous situation in which a thermonuclear war may break out at any moment”. “If the United States dares opt for a military action … the DPRK [Democratic People’s Republic of Korea] is ready to react to any mode of war desired by the Americans,” Mr Kim told a news conference at the UN headquarters in New York. “We will take the toughest counteraction against the provocateurs.” He said North Korea was acting in self defence and would respond to any threat of nuclear weapons or intercontinental ballistic missiles “in kind”. North Korea’s vice foreign minister has also maintained the threatening language, telling the BBC there would be “all-out war” if the US took military action. “We’ll be conducting more missile tests on a weekly, monthly and yearly basis,” Han Song-Ryol said. Mr Trump’s remark that North Korea has “gotta behave” was made off the cuff on Monday when he was asked whether he had any message for North Korea or its leader, Kim Jong-un. His comment comes after a tense weekend on the Korean Peninsula where the North celebrated the 105th birthday of its founding father, Kim Il-sung, with an elaborate military parade on Saturday that showed off its growing missile arsenal. The triumphant procession, intended to show off the nation’s military might, was followed by a major embarrassment for the current leader. A ballistic missile test launched near a submarine base on the country’s east coast failed seconds after lift-off Sunday morning. The US provoked North Korea’s ire when it sent a naval strike group, including aircraft carrier USS Carl Vinson and three guided-missile destroyers, to the region ahead of the anniversary, which is one of the biggest days on the country’s calendar. US vice president Mike Pence visited the South Korean capital Seoul on Monday as part of a tour of Asia, where he warned the North not to test the resolve of the US President on military matters. “The world witnessed the strength and resolve of our new president in actions taken in Syria and Afghanistan,” the US Vice President said. “North Korea would do well not to test his resolve or the strength of the armed forces of the United States in the region.” He said “all options are on the table” in response to North Korea and that the “era of strategic patience is over”. Two North Korean soldiers watched Mr Pence closely as he visited the demilitarised zone on Monday, with one taking photographs of the visiting leader. White House spokesman Sean Spicer said Mr Trump would not draw “red lines” over North Korea and he would continue to play his cards “close to his vest” in terms of his military strategy. “The action that he took in Syria showed, when appropriate, this President will take decisive action,” Mr Spicer said, in reference to Mr Trump’s missile attack in April in retaliation to the Middle Eastern nation’s use of chemical weapons against its own people. Mr Spicer also praised China for its “historic” decision to take a “much more active role” against North Korea through economic actions. “I don’t think there’s anybody in the world who would not believe that North Korea’s actions are both provocative and a concern,” Mr Spicer told reporters Monday afternoon. One security expert told The New York Times, the tension between the US and North Korea looks like “the Cuban missile crisis in slow motion".